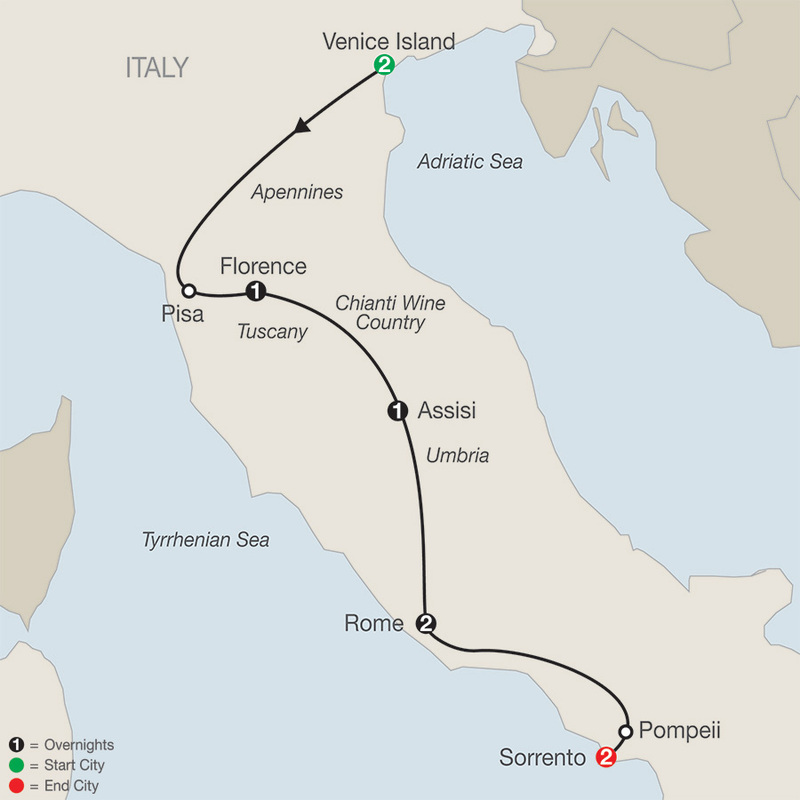 Visit some of Italy’s most iconic, romantic, and stunning locations on this escorted tour of Italy: from legendary Venice to Florence, Rome, and Sorrento. With fewer crowds and lower pricing, you’ll enjoy your time in Italy even more. What better way to start your Escape than with a delicious welcome dinner in Venice? Your Venetian experience also includes a private boat ride, a guided walking tour; a visit to St. Mark’s Square, its byzantine Basilica, the Doges’ Palace, and the Bridge of Sighs. Also witness the age-old tradition of glassblowing performed by a local artisan. Travel to Pisa—home of the famous Leaning Tower—before continuing on to Florence, considered to be the “Cradle of the Renaissance.” Florence is an art-lovers dream, and your sightseeing highlights include Michelangelo’s David statue in the Academy of Fine Arts. You’ll also travel to Assisi to visit the Basilica of St. Francis—named after the saint who sought the virtues of humility, forgiveness, simplicity, and best known for his love of God’s creatures. Spend two nights in Rome where your Local Guide takes you to the Vatican Museums and Sistine Chapel, where you will see Michelangelo’s The Last Judgment. You’ll visit St. Peter’s Square and Basilica—with the artist’s marble-sculpted masterpiece, La Pietà. Drive to the Imperial Roman Forum area to see the Colosseum—ancient arena of the gladiators, and be treated to dinner at a local restaurant. Journey along the Highway of the Sun to Pompeii—the legendary city both destroyed and preserved by erupting Mount Vesuvius. Get a sense of life during Rome’s ruling era with your expert Local Guide, then, continue to Sorrento for two nights. You’ll enjoy a full day of leisure in this charming bayside resort. Your Tour Director will share suggestions for spending free time in Sorrento. This is one Italy vacation you’ll remember not for the crowds, but for the ease of discovering these beautiful cities and sites of Bella Italia and Sorrento! Hotel B4 Bellini is situated in an elegant 18th-century patrician palazzo in the Cannareggio quarter, transformed into a hotel at the turn of the last century. Inside, the luxurious splendour of the 18th and 19th centuries lives on in the ancient marbles and magnificent Murano glass chandeliers, all set against rich period decor. The restaurant offers local specialties served in a dining room illuminated by splendidly decorated windows, guests can also relax comfortably and sip a cocktail in the enclosed garden. Free Wi-Fi internet access is available in all guestrooms and public areas of the hotel. Housed in a stately 18th-century building overlooking Piazza Santa Maria Novella, this 52-room romantic hotel has a cozy atmosphere with classic Florentine design, including beautiful stained glass windows from the Art Nouveau period. A generous breakfast buffet is served each morning in the informal breakfast room and there is an elegant bar serving cocktails and other drinks in a classically appointed room with marble floors and frescoed walls and ceilings. Free Wi-Fi access is available in all public areas and guestrooms. Modern hotel situated on the banks of the river Arno, steps away from the city center - Duomo and Palazzo Pitti nearby. Located in the historic heart of Florence, this upscale 55-room boutique property is housed in a restored 19th-century townhouse with elegant parlors, vaulted wooden ceilings and original Tuscan artwork. There is a bar in the antique library that works on an honor-system, a charming rooftop garden with city views and Free Wi-Fi internet access is available throughout. Breakfast is served in a lavish mirrored room on a long table decked out with silver candelabras and complimentary tea, coffee and cake are served between 5 and 7 p.m. daily. Set in its own lush garden, the hotel features 120 air-conditioned guestrooms complete with safe, satellite TV, and mini-bar. Amenities include a contemporary restaurant with international and regional menus and panoramic roof-top terrace with swimming pool and snack bar.